Nolloywood Stars To Grace Abuja Final audition for 2016 Miss Independence Nigeria Beauty Pageant . The crown might Just be yours! An official car, one year acting contract, one year modelling contract, foreign trip, endorsement by international and local firms. Abuja Final audition for 2016 Miss Independence Nigeria Beauty Pageant.venue is Zodiac Pub and Resort 24 porthacourt crescent of Gimbia street. Audition costume is blue trouser Jean and white or black tank top with heels.there Will be After audition party same place. click on register follow the instructions and fill the form.send the generic form no.and your name to 09059505173 or pick a hard copy form @ drumstick wuse 2. Come to the audition venue with your bank teller. @Facebook/miss Independence Nigeria Beauty Pageant or follow us on instagram@misssindependencenigeria or twitter @MINBpageant. 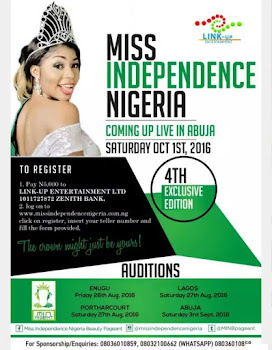 Miss Independence Nigeria Beauty Pageant 2016 The crown is Up again!! Do you know you could be the next queen! It is time to fulfill your dreams! News Flash! !Onuigbo Beauty Wins First Face of Ranch intl As she releases New Hot Photos. Queen Cynthia Exposes Queen of Trust Pageant..said she was asked to Sleep with a Politician.Read!